Graphical User Interface for spin label modeling. slmodgui runs a set of shell scripts from a library (provided) which can perform in silico mutation of a protein residue to a spin label, Monte Carlo minimization, Molecular Dynamics simulations, and more specialized tasks using CHARMM. The user must have python 2.x and wxpython installed, and provide their own charmm binary file. The shell scripts, charmm stream files, and spin label forcefields were originally developed by Ken Sale, later modified by Peter Fajer, Mikolai Fajer, and myself. The graphical user interface is entirely developed by me, in consultance with Peter Fajer. 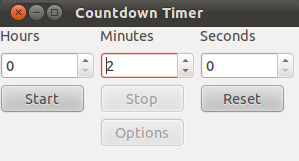 I wrote a small alarm-clock application in python which works on windows, linux, and mac. Source code is here. You’ll need python and wxpython installed to run it from source. CWdipFit is a data analysis program for dipolarly broadened CW spectra. The program assumes a sum of Gaussian shaped distance distributions between spins, and utilizes Monte Carlo/SIMPLEX curve fitting to actual data. CWdipFit is written in Matlab and is provided as source code. -Matlab v7.0.1 or higher with optimization toolbox. -Navigate to the folder you installed CWdipFit. README file is included in the package. Sen KI, Logan TM, and Fajer PG (2007) Biochemistry 46, 11639-11649. DEFit is a Double Electron-Electron Resonance (DEER) data analysis program which assumes models of overlapping Gaussian shaped distance distributions between spins. DEFit utilizes Monte Carlo/SIMPLEX curve fitting to actual data, not to Fourier transform. The program is written in Matlab and is provided as source code. A quick start guide is included in the package.